We are perfectly positioned to benefit from any January volatility. After we close DLTR at the open on Tuesday, we will only have four active positions. The volatility over the last couple weeks eliminated the rest. Readers should have a lot of ready cash and be ready to put it to work. There is a strong chance we could see some volatility in early January that could provide some great buying opportunities. In four of the last five years, the first two weeks of January posted declines. In 2016 the S&P fell more than 10% in less than three weeks. I do not expect a repeat of that drop but the Dow components are very overbought. 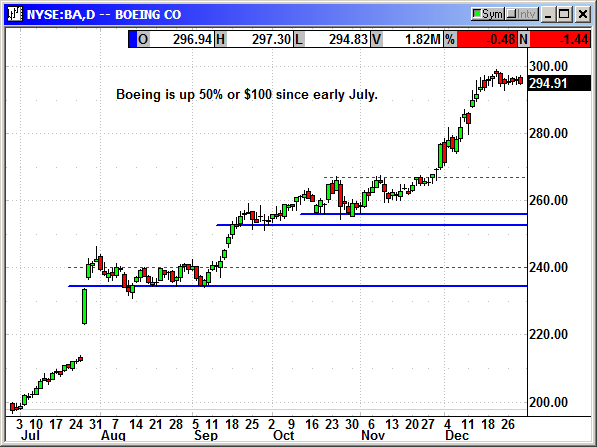 Stocks like BA, CAT, HD, WMT, UTX, VZ, etc could easily see some serious profit taking. Unfortunately, two of those are in our portfolio. I did raise the stop losses. Despite the recent historical trend, there is no guarantee the market will decline. Actually the first day in January tends to be up because of the inflows from end of year retirement contributions hitting fund accounts. If we do have a volatility event I would expect any decline to be short, sharp and shallow. 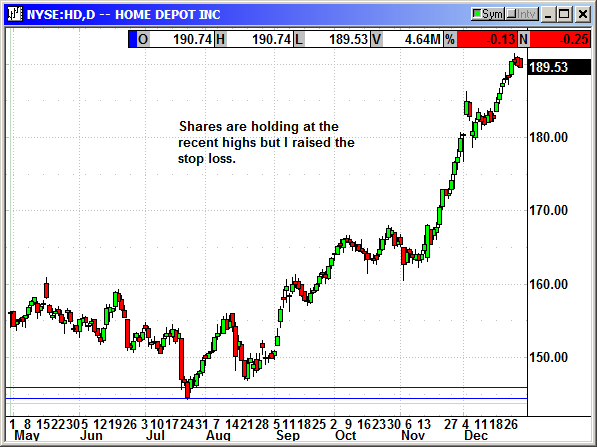 There are too many investors waiting for a buying opportunity and any material dip will likely be bought. 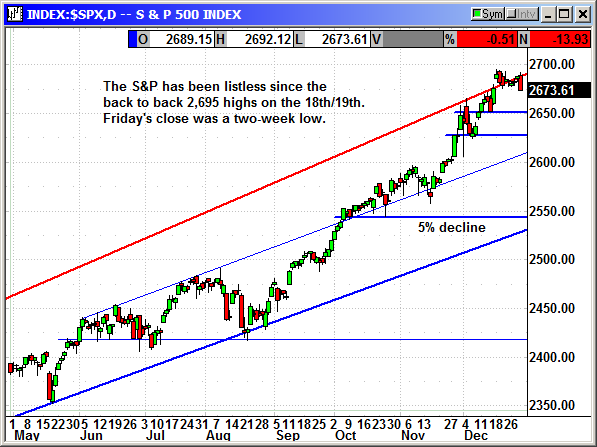 The S&P has been struggling to hold its gains for the last two weeks. Friday's close was a two-week low. Any gain next week is going to find strong resistance at 2692-2695. Initial support is 2,650 followed by 2,625, which should hold unless we get a washout. A 5% drop would take it back to 2,550 but I seriously doubt that will happen. A more realistic 3% drop would be to 2,609. For planning purposes, I am projecting a market decline starting in early May. The Q4 earnings should support the market with guidance related to increased cash flow related to the tax reform. 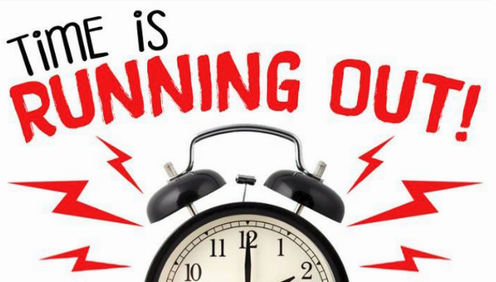 By the time we are half through the Q1 earnings cycle that starts in mid April, the outcome for the year should be known and portfolio managers may be ready to exit positions ahead of the summer doldrums. If the market has not had a significant decline before early May, the summer weakness could be severe. It has been two years since a 10% drop in January 2016. Normally we see one 10% and two 5% per year. There was a 3.1% decline in August. That was the biggest decline since January 2016. 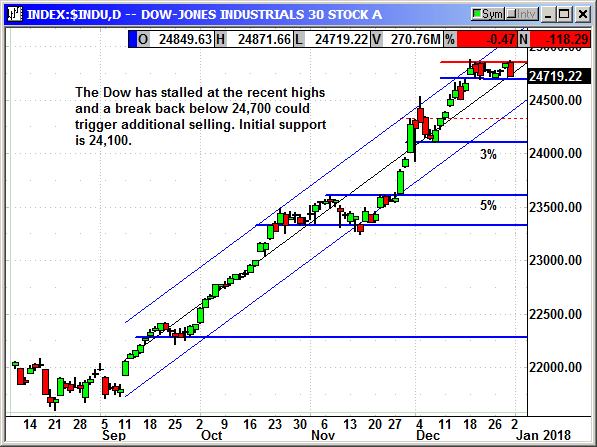 The Dow has rock solid resistance at 24,850 and closed right at initial support of 24,720 on Friday. So many of the Dow components have had enormous gains over the last four months that a drop in the Dow is almost guaranteed. A 3% decline would target 24,100 and a 5% decline around 23,600. I would be surprised if the 24,100 level failed but it is entirely possible. The Nasdaq is the weakest index. The big cap tech stocks have been lethargic with most of them already in a minor decline. If that increases in January, the Nasdaq could be the index that drags all the other markets lower. The 3% decline target would be around 6,775 and the 5% at 6,635. The Nasdaq has paused numerous times on the way up so it is not as overbought as the Dow. 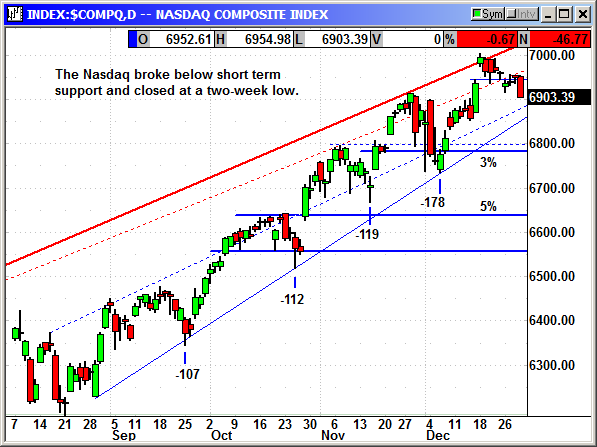 However, the Nasdaq components have been weaker in late December and suggest there could be further weakness in January. The Russell 2000 was actually the most bullish index last week. The Russell closed at a new high on Thursday by 0.0013 points. 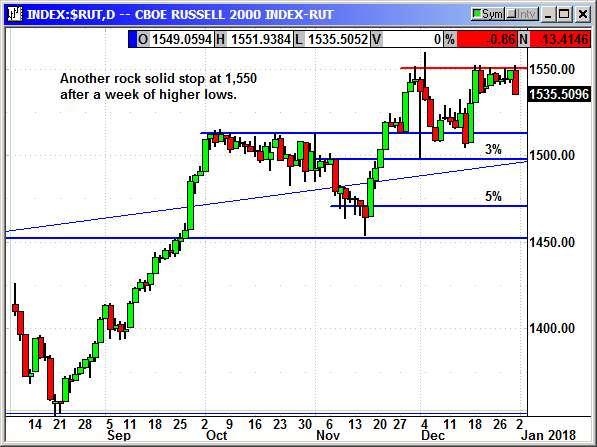 There was an attempt to break through the 1,550 resistance on Friday but it was solid and refused to budge. 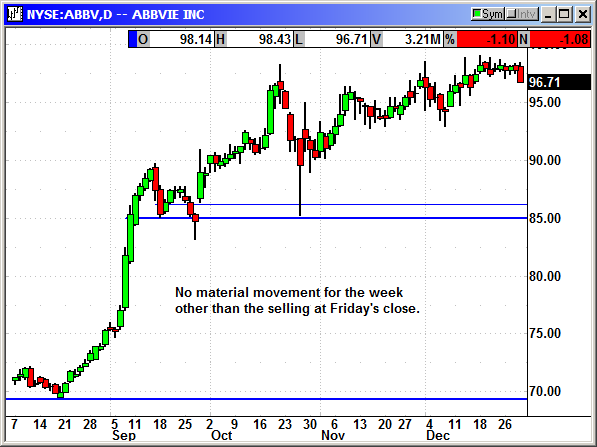 The close was still a two-week low. A 3% decline would be 1,502 and a 5% at roughly 1,470. ZERO TRADING DAYS LEFT IN 2017 !!! ORDER YOUR 2018 SUBSCRIPTION NOW! Don't forget to reward yourself with our 2017 End-of-Year Annual Subscription Sale! You’ll save $1,147 when you renew now. 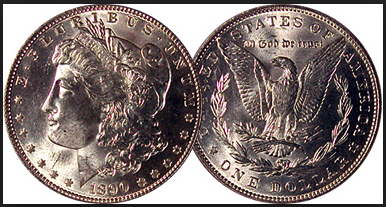 Each EOY subscriber will receive a genuine Morgan Dollar, which is thought to be one of the best looking silver coins ever minted. These make great Christmas presents! The hurdle the market will have to overcome is the potential government shutdown on January 19th. The opposing sides in Washington seem to be growing farther apart every day on what they are willing to accept in order to pass a real government funding bill. With the House still on vacation next week, the fireworks will not begin until somewhere around January 10th. Hopefully, they can reach some agreement and not crash the market as they did with the last government shutdown. This is a big week for economic reports with the ADP and Nonfarm payrolls. There is also the ISM and ISM Services and the FOMC minutes. As long as these reports are close to expectations they should not be market movers. The market will be moving on its own on portfolio restructuring before the Q4 earnings cycle and the economic numbers will be ignored. The earnings calendar is lackluster with only Rite Aid and Walgreens as the highlights with Monsanto and Constellation Brands as honorable mentions. For the last two weeks, resistance was rock solid. That is a clue of what we should expect in January. 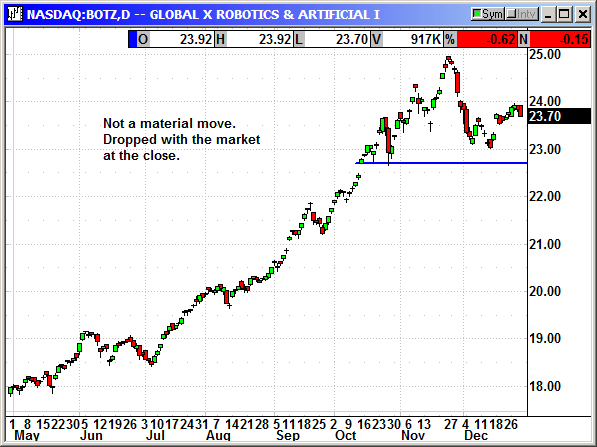 In order for resistance to be solid there needs to be a large number of sellers at those levels. The Dow was 24,850, which was just below the unofficial target for the year at 25,000. Sellers parked their sell orders at that level and every attempt to move higher was met with a sharp increase in selling volume. For January, the new tax year will allow investors to close positions they have been holding with fingers crossed hoping to make it to 2018. There is no longer any reason for them not to take profits and restructure their portfolios ahead of the Q4 earnings cycle. Nobody can predict market movement. We can theorize based on the fundamentals and technicals but there is always that tsunami of unknowns made up of a million investors all acting at once in their own behalf. Nobody can predict what the herd will do but in this instance, we can make a calculated guess. I expect the market to decline next week. If it does not, I will be thrilled and we will retain our profitable positions. If it does decline, we will take profits and look to reenter some positions with a more favorable option. Keep some cash in your account in case we get a great buying opportunity. There is always another day to trade if you have money in your account. This play has nothing to do with the fundamentals of UTX. This is strictly a position to capitalize on any early January decline in the Dow. 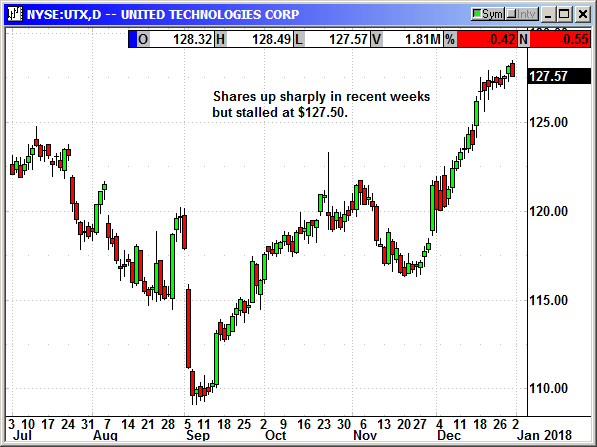 UTX has rallied sharply since September and is currently sitting at a record high. If the recent Dow leaders sell off in January it could be a sharp drop. I would rather have played BA or CAT but their options are double or triple the price on UTX. I am not looking for a big drop but the $123 level is possible. The S&P futures are up nearly $4 on Monday night so any opening spike on the Dow could give us an ideal fill on this put. This will be a very short-term position as in 1-2 weeks. Buy Feb $125 put, currently $1.99. No initial stop loss just in case the market opens higher. The long call position was stopped at $104.85. The long call position was stopped at $56.25. The long call position was stopped at $79.50. No specific news. 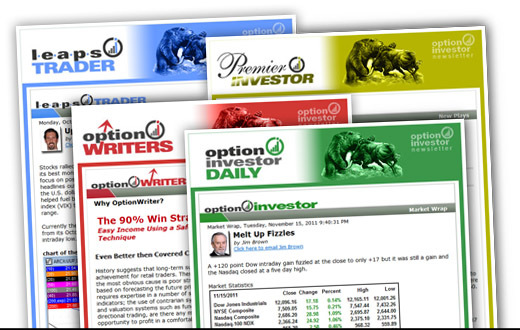 Shares flat for the week except for the drop with the market at Friday's close. No specific news. Shares finally broke below the 200-day average to stop us out. Autodesk was flying high a week ago at $130 but fell off a cliff after earnings. Shares plunged to $105 on weaker than expected subscriber additions. Autodesk is converting from the software sales model to the software as a service model with various subscription plans. This will produce steady earnings in the future but it normally rocky in the first two years of conversion as we have seen with a dozen other companies. ADSK shares have moved sideways for the last week despite the Nasdaq crash. Three other stocks in this sector have been crashing. Those are CDNS, ANSS, SNPS. I believe the ADSK decline is about over. Once it begins to rebound it should return to its prior trend. 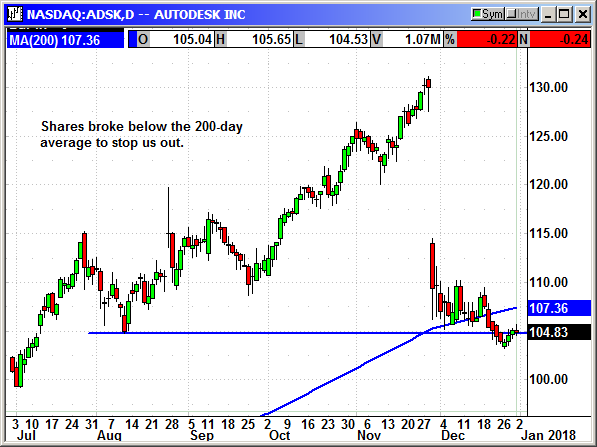 As the market rises higher, Autodesk begins to look like a value stock after a $25 hair cut. Update 12/10: Shares traded sideways for the week as analysts try to decide if the next direction is going to be higher or lower. I reread all the commentary since the conference call and I believe the restructuring is going to be positive. Basically, they said they were going to shutdown all the noncore operations and simply focus on making the core business better. I believe they grew too fast and prior management was spreading the effort into other areas that would not be highly profitable. The new management said, focus on the profitable areas and trim the costs and other efforts. Time will tell if I am right. Closed 12/20: Long March $115 call @ $5.25, exit $2.96, -2.29 loss. No specific news. The decline in the chip sector on Friday blunted the rebound. Since most of the components are chip stocks this is is a play on the leading edge chip companies. Nvidia is a major holding. No specific news. 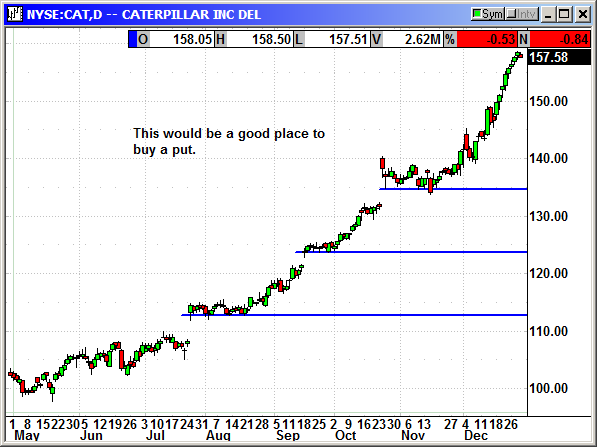 CAT shares peaked on Thursday at $158.50 and in a normal market they would be setup for a nasty decline. This has been the second biggest Dow gainer over the last five months. I raised the stop loss just in case the stock rolls over. No specific news. 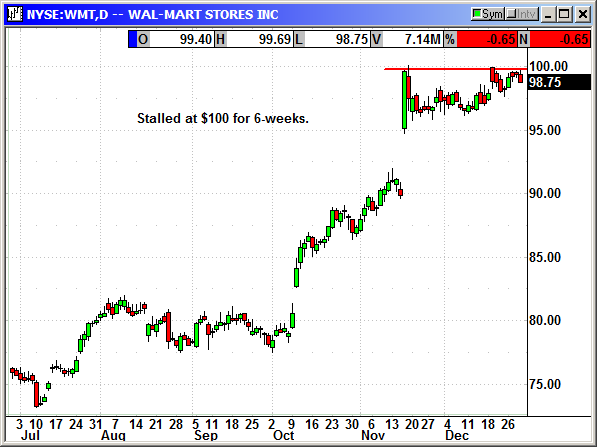 Holiday shopping is over and retail stocks may be gettnig ready to decline. This is a January position and it is time to exit. Close the position. Original Trade Description: September 11th. Dollar Tree reported earnings in late August that rose 36.1% to 99 cents and beat estimates for 87 cents. Revenue of $5.28 billion rose 5.7% and beat estimates for 5.24 billion. Same store sales rose 2.4%. They guided for the full year for revenue of $22.07-$22.28 billion, up from $21,95-$22.25 billion. Earnings guidance of $4.44-$4.60 rose from $4.17-$4.43. Shares spiked $6 on the earnings and then went through a week of post earnings depression. Shares have firmed and are right on the verge of breaking through resistance to a 9 month high, and probably higher. After earnings Raymond James upgraded them from market perform to strong buy. Bernstein upgraded from underperform to market perform. Telset Advisory reiterated an outperform. Shares are right at resistance at $83.50 and a 5-month high. They are poised for a breakout with the next resistance at $90. The November options expire several days before earnings so I am going with the January strikes so there is some earnings expectations in the premium when we exit before the event. Update 11/27: DLTR reported earnings of $1.01 that beat estimates for $90 cents and was well above the 70 cents reported in the year ago quarter. Revenue of $5.32 billion beat estimates for $5.28 billion. For the current quarter, they guided for revenue in the range of $6.32-$6.43 billion and analysts were expecting $6.26 billion. Full year earnings guidance was $4.64-$4.73 and $22.2-$22.31 billion. That is up from $4.44-$4.60 in prior guidance. Analysts were expecting $4.69. 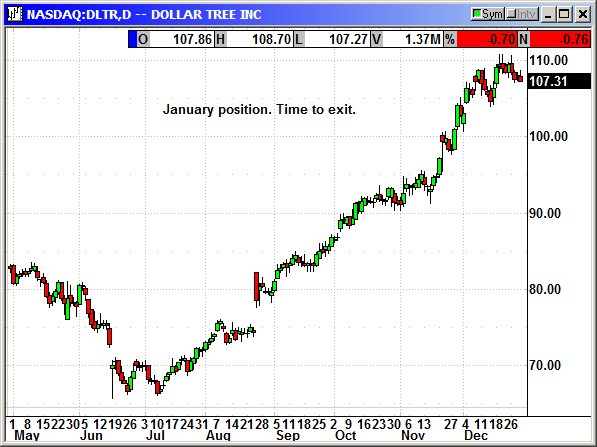 Long Jan $87.50 call @ $3.30, see portfolio graphic for stop loss. No specific news. 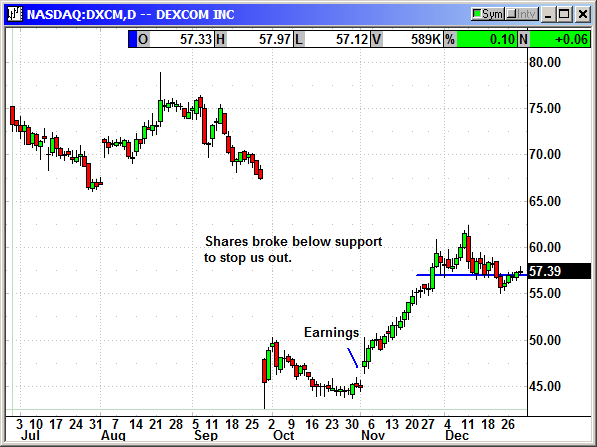 Shares broke below support to stop us out for a minor gain. DexCom, Inc., a medical device company, together with its subsidiaries, focuses on the design, development, and commercialization of continuous glucose monitoring (CGM) systems in the United States and internationally. The company offers its systems for ambulatory use by people with diabetes; and for use by healthcare providers in the hospital for the treatment of patients with and without diabetes. Its products include DexCom G4 PLATINUM system for continuous use by adults with diabetes; DexCom G4 PLATINUM with Share, a remote monitoring system; and DexCom G5 Mobile, a CGM system that directly communicates to a patient's mobile and its data can be integrated with DexCom CLARITY, which is a next generation cloud-based reporting software for personalized, easy-to-understand analysis of trends to improve diabetes management. The company also offers sensor augmented insulin pumps. It has a collaboration and license agreement with Verily Life Sciences LLC to develop a series of next-generation CGM products. The company markets its products directly to endocrinologists, physicians, and diabetes educators. Company description from FinViz.com. DSCM was slammed for a $22 loss at the open on Sept 28th on news that Abbott Labs had made a glucose monitoring system that did not require the daily pinprick to draw a drop of blood. Shares fell from $67.50 to $44.50 and stayed there for a month. Investors feared diabetics would drop the DexCom monitoring products in a heartbeat and move to Abbott's system. On November 1st, the company posted better than expected earnings and revenue and the stock began to rise again. The DexCom CEO gave an interview on CNBC last week and he said the Abbott system will not have a dramatic impact to DexCom sales. He pointed out that they had been competing against the Abbott Libre system in Europe for three years and growth has continued to rise. It wa sup 80% in Q3 alone. The CEO said the DexCom system does much more than the Abbott system. "Our system connects to phones. We share data with people who watch patients. We offer performance and accuracy that others do not. He said DexCom could release its own blood-free glucose monitoring device by the end of 2018. DexCom is also in a venture with Apple to monitor glucose through the Apple Watch. The data will go straight to the cloud for monitoring and there will be no need to communicate through a daily phone call. The watch will become your monitoring device. The $20 drop was serious overkill and the stock is rebounding now that investors understand there is no immediate impact and there are new devices on the horizon. Closed 12/21: Long Mar $60 Call @ $2.75, exit $3.18, +.43 gain. No specific news. Shares closed at a new high on Tuesday but faded with the market the rest of the week. With the holiday shopping season over there could be weakness ahead. However, HD will benefit greatly from the tax changes and that could provide support. HD is reportedly talking to XPO Logistics about an acquisition of the $9 billion company. HD uses them to deliver large items like refrigerators and other appliances. There could be a battle with Amazon since that large item shipping is a problem for Amazon. The rally on the announcement of the settlement with Toshiba over the chip business faded quickly. Helping the decline was the news that Seagate scored a partnership with the winners of the Toshiba bid and now Seagate will have access to unlimited cheap memory making it a stronger competitor against WDC. Shares fell hard on the news and we were stopped out. Western Digital Corporation, together with its subsidiaries, develops, manufactures, and sells data storage devices and solutions worldwide. It offers performance hard disk drives (HDDs) that are used in enterprise servers, data analysis, and other enterprise applications; capacity HDDs and drive configurations for use in data storage systems and tiered storage models; and enterprise solid state drives (SSDs), including NAND-flash SSDs and software solutions that are designed to enhance the performance in various enterprise workload environments. The company also provides system solutions that offer petabyte scalable capacity; data storage platforms and systems; datacenter software and systems; and HDDs and SSDs for desktop and notebook PCs, gaming consoles, security surveillance systems, and set top boxes. In addition, it offers NAND-flash embedded storage products for mobile phones, tablets, notebook PCs, and other portable and wearable devices, automotive, IoT, and connected home applications; NAND-flash memory wafers; and custom embedded solutions and iNAND embedded flash products, such as multi-chip package solutions that combine NAND-flash and mobile dynamic random-access memory in an integrated package. Further, it provides client solutions that consist of HDDs and SSDs embedded into external storage products; removable cards for use in mobile phones, tablets, imaging systems, still cameras, action video cameras, and security surveillance systems; USB flash drives used in computing and consumer markets; and wireless drive products. Additionally, the company licenses its intellectual property. It sells its products under the HGST, SanDisk, and WD brands to original equipment manufacturers (OEMs), distributors, resellers, cloud infrastructure players, and retailers. It serves storage subsystem suppliers, OEMs, Internet and social media infrastructure players, and PC and Mac OEMs. The company was founded in 1970 and is headquartered in San Jose, California. Company description from FinViz.com. 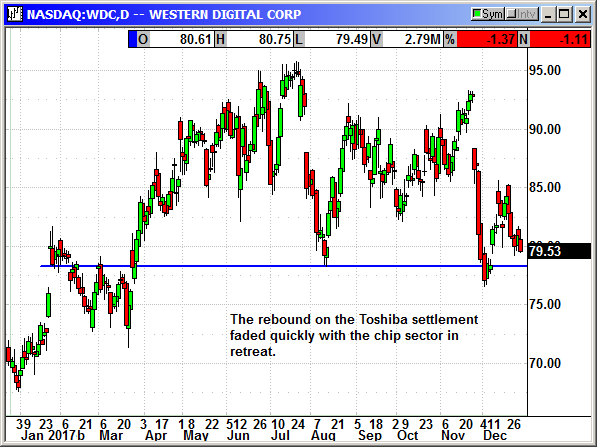 Western Digital has been fighting Toshiba's sale of their joint venture chip unit for several months. WDC gained a 50% interest when it acquired Sandisk in 2016. This is a big deal for WDC since the company can use the memory in its disk drive business at a very low cost. Toshiba got in trouble when it bought Westinghouse Electric before the company was forced to file bankruptcy for problems related to some nuclear plants under construction. Toshiba ran out of cash and was in danger of being delisted in early 2018 if it could not raise some capital. They decided to sell their 50% of the chip business. There were several rounds of bidding and a sale was eventually awarded to a consortium headed by Bain. WDC said their joint venture agreements gave WDC the right to approve any sale and they filed an arbitration case and a suit to halt the sale. WDC had also bid but the feelings between the two companies had been so corrupted by the arguing and legal issues that Toshiba awarded the deal to Bain. They have been in negotiations for the last two months to solve their legal issues. The Bain deal cannot close until WDC and Toshiba settle those issues that are clouding the sale. The WSJ is reporting there could be a settlement later this week. I believe this will remove a cloud from WDC shares and cement their relationship with Toshiba and the new consortium for years into the future. Update 12/18: Toshiba and WDC announced they have settled their disagreements. WDC will remain a partner in Toshiba Memory Corp and will be able to invest in all future plants and upgrades, have access to memory at cost and they did not have to spend billions to do it. This was a win for WDC and shares moved higher on the news. 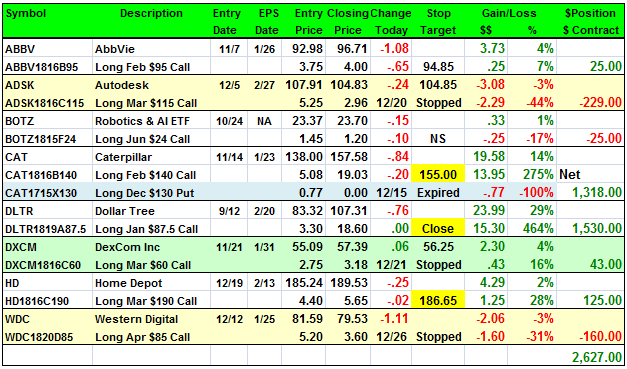 Closed 12/26: Long April $85 call @ $5.20, exit $3.60, -1.60 loss.